PHNOM PENH, Oct. 30 (Xinhuanet) -- Cambodia's new monarch Norodom Sihamoni said in his first national address here Saturday morning that he will follow his retired father king Norodom Sihanouk's teachings to be a faithful and devoted servant of the nation and the people. In front of about 50,000 well-wishers, the 51-year-old king said from the Royal Pavilion "I will never live apart from the beloved people. The Royal Palace will remain a transparent house." He said for him there will never be an ivory tower. "Every week,I will devote several days to visiting our towns, our countryside and our provinces, and to serving you." He promised to remember for ever his father's teachings "to be a pure patriot" and "only think of the interest of the homeland, the nation and the people." The new monarch also promised to be "clean" as his father instructed and banish favoritism and injustice, and prevent members of the family, courtiers and flatters from using him for their own interests. The unmarried king, who spent long time outside the country, said when the Royal Council named him the king, he was afraid he could not fulfill the obligations because of his inexperience in politics, however his father encouraged him to take the royal duty. "When I was enthroned I was only 19 and I was not as experienced and learned as you are today," Sihamoni quoted his father as saying. King Sihamoni, who ascended the throne at a coronation ceremonyFriday evening, also urged the Cambodian people to get united to work for the betterment of the country. He thanked the Royal Council and those who had supported him tobe king for giving him the chance to serve the country. Senate President Chea Sim, National Assembly President Prince Ranariddh and Prime Minister Hun Sen also delivered speeches during the hour-long proceedings. They praised highly the retired king Sihanouk's great contribution to the country and hoped the new king will carry out his father's noble cause to turn Cambodia into a prosperous and economically developed country. Over 200 foreign diplomats and NGO representative in Phnom Penhalso took part in the meeting taken place in front of the Royal Palace which overlooks the Tonle Sap River. Prior to the meeting, the new monarch in an open car, waved to the rousing well-wishers carrying national flags and portraits of the new king and former king Sihanouk and queen Monineath. Cambodia's new King Norodom Sihamoni has addressed his people for the first time and promised to be their "faithful and loyal servant". Tens of thousands of people descended on the Royal Palace in Phnom Penh to hear the new monarch speak. The former ballet dancer was enthroned on Friday, amid three days of glittering coronation celebrations. He has taken over from his father, King Norodom Sihanouk, who has bowed out after a reign of more than 60 years. "My father... told me the king is not the boss of the people. 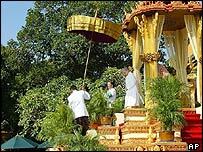 Instead, we must keep ourselves humble to the people to serve the interests of the nation," said King Sihamoni, speaking from a balcony, under a huge parasol. "I will always be with you, to share happiness and sadness together with you." Correspondents described the atmosphere as festive, with balloons and white doves released into the air in celebration. The crowd was made up mostly of military personnel, government employees and school children, said the BBC's Guy De Launey in Phnom Penh. Prime Minister Hun Sen paid tribute to King Sihamoni and his father. "The continuity of the constitutional monarchy is a key to the stability of the kingdom of Cambodia," he said. Little is known about the new king, aged 51, who has spent much of his life outside Cambodia - as a ballet dancer and teacher, as well as Cambodia's ambassador to the UN cultural agency, Unesco. So curious were some of the crowd to get a glimpse of him on Saturday, they broke through a blockade before being ushered back, the Associated Press reported. "I've seen the face of the old king many times already, but now I want to see the face of the new one," said Chea Uorn, 79, who had travelled 80km (50 miles) to attend the ceremony. 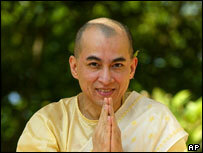 One of Sihamoni's potential strengths is that he is seen as apolitical. However, that did not stop one lone protester from slipping through a security cordon to parade a banner saying "Evil China" in front of the new king, whose father had close ties with Beijing. While Cambodian kings used to have great authority, the position is now largely symbolic, but it remains an important post because of the reverence Cambodian people give to the royal family.